The Archaeological Site of Leptis Magna are the remains of the Phoenician port Lpgy, that was integrated into the Roman Empire in 46 BC. After Septimus Severus became emperor here (in 193), it became one of the most beautiful cities of the Roman world. Its assets as a WHS are the level of urban planning, the role it played in the movement back to antiquity (right after its rediscovery in the 17th century) and the witness it bears to a great civilization. What did the Romans ever do for us? 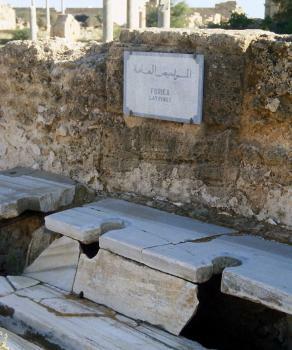 Well, there are some beautifully preserved Public Toilets at Leptis Magna (see photo) which show a degree of civilisation unmatched in many places around the world today! 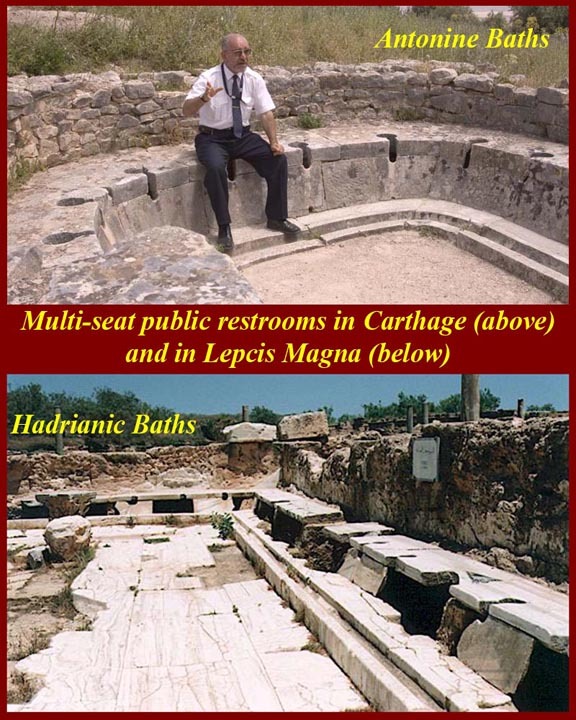 Letpis Magna also has its fair share of triumphal arches, temples, baths, theatres, mosaics etc but it is perhaps the “ordinary” things of life which bring home most what life was like and the continuity until today. 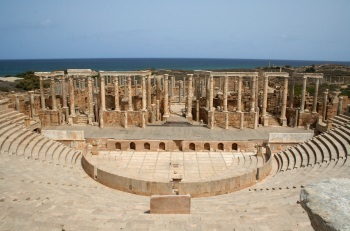 Apart from Pompeii I do not know of any ruined roman city which is as “complete” as Leptis Magna. You are going to get your fill of “Roman ruins” in Libya – The others each have their “gems” but Leptis as a whole is unmatched and should not be missed. Lighthouses: The base of a 30-35m high lighthouse. It was a twin of one of the Seven Wonders of the Ancient World, the Pharos of Alexandria. Built in the 3rd century: Septimus Severus renewed the town after he became Roman emperor in 193; in 203 an arch was erected in his honour, and "At the end of his 203 visit Septimius Severus gave orders for a general upgrade to the facilities of Leptis and in particular for the construction of a series of public buildings"